The engine of SpaceX's Falcon booster. The maidenflight of the SpaceX Falcon 1 booster is being pushed to late October due to anengine failure at the company's Texas test facility. 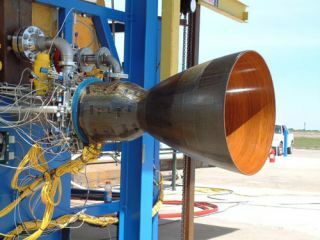 Called theMerlin, this main stage engine was undergoing qualification testing at SpaceXtest facilities, located in Central Texas. "We didhave an ablative chamber fail during the Merlin qualification program,"explained Elon Musk, head of the entrepreneurial SpaceX, based in El Segundo,California. Muskresponded to a SPACE.com inquiry, noting that the Falcon 1 engine nowbeing prepared for first flight at the firm's private rocket facilities at aKwajalein Atoll launch area in the western Pacific Ocean has been acceptancetested. The Merlin passed with flying colors and is mounted in the first stageat Kwajalein, he said. The Merlinengine problem, Musk said, occurred during a qualification program. Thatactivity involves taking a series of engines and testing them in unusualcircumstances, such as high and low mixture ratio, high and low thrust, hot andcold fuel temperatures, maximum suction speed on the turbopump, etc. Italso tests for consistency of manufacturing, he added. "To thebest of my knowledge, every booster engine qualification program in history hashad numerous failures of the kind that recently occurred with Merlin, so thisis not unusual," Musk said. Oddly, thechamber that failed was chamber 13, Musk said. "We believe it was due toa variance in manufacturing, given that the prior 12 worked fine. Toaddress this issue, we are adding additional quality assurance tests andincreasing film cooling flow as a failsafe." Due to theengine qualification failure, Musk said the premier flight of Falcon 1 is to bepushed back a few weeks "to late versus early October as we verify theeffectiveness of the above changes. We are taking no chances." Merlin wasdeveloped internally at SpaceX, but draws upon a long heritage of space provenengines. For example, the fuel injector design at the heart of the engine wasfirst used in the Apollo lunar module landing engine. SpaceX wasfounded in June 2002 by Musk, co-founder of PayPal, the electronic paymentsystem.